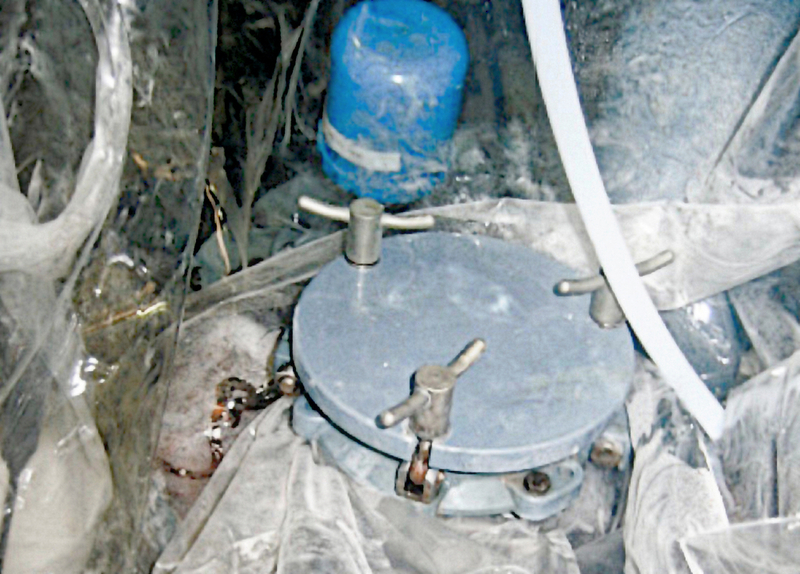 A reactor enclosure fitted onto the nozzle used for materials addition and in-process sampling. The reactor is on a mezzanine in a 1960's facility with much immovable equipment in the shared non-cleanable space. BEFORE: A 1960's era 2-storey pilot plant. Impossible to clean. Close-up view of the top of the tank and the charging nozzle. The limited access is readily accommodated, allowing access to relevant glovebag attachments as needed. The glovebag is tall enough to admit a long sample drogue. The tank nozzle is accessible for both charging and sampling. Once the processing is complete, clean-up consists of fogging the painted metal surfaces, collapsing the glovebag, securing, tieing-off, and removing the upper part of the glovebag. The remaining glovebag stub is cautiously slit open and the water encapsulated equipment swabbed down. All waste is sent for incineration. The cost of scratch building a contained pilot plant for performing scale-up studies of highly potent compounds has become prohibitive! Our clients have a long history of performing functional retrofit of existing facilities and equipment. Indeed, this is where FabOhio, Inc. first entered into the Pharmaceutical Industry in 1973 in partnership with one of the largest manufacturing company's at that time. Once proof of performance was established, flexible glovebags and enclosures became the mainstay of the industry. The enclosure is supported from overhead. It is draped to avoid contact with surfaces exceeding 180 degree's Fahrenheit. The operators visibility andaccess are not constrained. Final product can be recovered using added airlocks, pass-through sleeves, or after the equipment is cleaned down. An electropolished steel frame was constructed around pilot plant equipment. A replacement glovebag is used for each process. Operator visibility and access is not constrained. Multiple pass-through sleeves allow for clean and dirty materials pathways. Contaminated waste is enclosed is the dirty sleeve. There is virtually no size limit that applies to flexible enclosures. Existing uses range from small utility to full manufacturing suite assemblies with gowning and decontamination built in. They all have the advantage of being low cost installations which can be assembled and used within hours of receipt. They are also easy to dispose of. Proper planning allows the use of external frame supports which allows for the entire flexible enclosure to be collapsed without dis-assembly, rolled up, and disposed of in a burn drum. Multiple ways of materials entry allows for drummed materials or bagged material entry.. Exhaust vents can be coupled together for purging or gas scrubbing purposes. The entire enclosure can be inerted with nitrogen, argon, etc. making for safe materials handling at <4% oxygen conditions. Different commercially available coupling adapters can be installed. Shown is a coupling method for a bag dispensing system. Alternative devices allow for vessel charging. The wide mouth of the glovesleeve entry plus film flexibility provides long reach for a containment device. The personnel reach exceeds the conventional 21 inch reach designed for hardwall containment. This allows for a deeper enclosure design where needed. The glovebags have separate functions. On the left it is used for in-process filter change-out. On the right it is used for sampling. PVC support frames are suspended from an overhead pipe or structure. Pass-through sleeves allow for admission of filters and sample bottles. Additional sleeves allow for safe removal of used filters, or samples which are delivered to the laboratory in the overpack. SIzes are made to accomadate. Economical glovebags can be manufactured to adapt to multiple constraints. Ceiling supports using installed grommets and bungy cords, Frame mounted supports using Velcro strips allow for both positive and negative pressure operations. Inflated frames allows for completemobility. All are capable of inerting/purging. Ambient light and unrestricted access allow for maximum utility. Flexible barriers allow flexibility in design without high cost. They can be designed to conform to virtually any shape and configuration. Unobstructed lighting, access, and visibility, make for design simplicity. Typical design costs are <$300 for a simple structure.